Leading up to this run, I was a little uncertain of what exactly would transpire on race day. Since this race was only 4 weeks after running the Juan de Fuca Trail, I had little time to really recover from that race and gear up for this one. However, I was banking on my previous long races to be all the training I needed to get my through this one. I felt that my levels of hydration and nutrition were great heading into race day. The logistical planning pieces were also coming into shape nicely. The only real concern I had was overracing, as this was my 3rd ultra in 7 weeks. After staying at my parents place in Duncan the night before, I was thrilled that I got such a good sleep the night before the run (6 hours). I went to bed a 9 am and was up at 3:30 am. My gear was all prepared from the night before, and I was now driving to Lake Cowichan in the darkness to my rendezvous point. I arrived in good time and met with Elaine and Andy Galbraith who kindly offered to take me up to the start in Youbou. Elaine was running the event, but Andy was just dropping her off as he had to work that day. The finish line in Lake Cowichan is 8 km away from the starting point in Youbou, so most people take a bus shuttle before the run. The only problem is that the shuttle leaves at 3:30 am, about 1.5 hours before the start of this race. Last year I got chilled to the bone waiting around for the start. On the way up to Youbou, we spotted an elk as we entered Youbou. It was pretty cool. Last year, I also saw elk actually on the race course...so now we are 2/2 with this. As we parked the car, I thanked Elaine and Andy for the ride and quickly made my way up to the main rec. hall where all the runners and walkers gathered before the race. Being the competitive person I am, I quickly scanned the hall for elite runners. With the exception of Campbell River's Rob Fontaine, I saw nobody else. It appeared as if there were a couple of social runners, but nobody that I could really recognize. To my surprise, Mark and Shawn Nelson were not there, even though I was supposed to be meeting them at the start line to discuss potential adventures for 2010. At the start line, I did spot a couple of other runners: Rob Smith of Victoria and Allan Crawshaw of Sidney. Allan did beat me last year in this race, so it was time to get serious and now it was showtime. After participating in the annual ritual of signing the National Anthem, the organizers said "Go!" and we abruptly left the parking lot and were now off down the dark road. At this point, the course was paved, but this only lasted for about a kilometre or so. Everyone had headlamps on, and shortly after the start, those lights were the only thing we had to see. The conditions were great, but extremely dark. It had rained the night before, which made the upcoming dusty logging road not so dusty. It was cool and pretty perfect for a distance run. Rob Fontaine and I easily took to the front and established a comfortable pace. Having run this course last year, I had a race plan in mind and the main plan was to learn from my mistakes of last year. Starting out slow and keeping the scheduled nutrition would be key if I were to have a good day. The pavement ended and the gravel logging road would be the theme for the next while. Unlike last year, the road was not graded, so although the road was firmer, it also was a pothole-fest. I have never thought of a gravel logging road being technical running, but this certainly was. Once wrong step, and the ankle could go. I was definitely thankful for having such a bright light. Rob and I spent the better part of the first run getting acquainted. We knew each other a little bit (mainly through our mutual friend Bob Wall), but these are intimate times. Not much else to do really except get to know each other. We didn't talk a great deal, but just enough to know that we both planned on finishing 1,2. Rob had his Garmin watch going, so he was able to tell me the distance travelled. This was a pretty handy tool for me, as the course was unmarked, and I only just ever run with the stopwatch. At 10k, Rob informed me that we were doing 46 mins/10k. This was perfect for me, as this is my typical endurance pace and I again felt that I wasn't being pushed by running with Rob. He, too, could have gone much faster at this point, but there is great danger in a long distance race if you start out too fast. At the aid stations, Rob would stop and fuel up...and I kept going. Unlike last year, I was running with my Nathan Hydropack this time around. I figured it was safe to run with it, even though it made my 6 lbs. heavier. It was loaded with my Carbo-Pro and gels, and I had grown quite comfortable over the course of the year of running with it. I stuck to my nutrition plan early and things were going great early on. Close to the 20k aid station (which we did in another 46 mins. ), I joked around with Rob and asked him if he brushed his teeth that morning. I replied, "Well, you wanna look good for the photo at the end when you win." He then said, "Yea, I'll probably have bits of sticky, gold gel packages stuck in my teeth." I then informed Rob that if he wanted to pick up the pace he could. I told him that I would be slowing down over the next 10k to save my energy for the hills which lie much further ahead. He agreed that slowing down was smart, but then as I slowed down to fuel myself, he surged ahead. I was totally fine that he went ahead, and in fact, I was happy that he would not be pushing my pace this day. Slowly I could see him extend his lead over the next few kilometres until he was out of sight. The course remained the same, except after the 20k aid station, the potholes were far and few between. The only difference was that the flat course was no longer flat. Slow, rolling hills set in and my pace laboured slightly. I was still feeling alright at the 28k (midway) point in the race. I think I was around my time from last year, but without kilometre markers, it was difficult to tell. I was generally just going on feel. As I approached the 33k aid station (Station #5), I could hear and see a little commotion up ahead. Bloody hell. It was Rob Fontaine, and he didn't look pleased. I ran by the aid station and joined Rob who just started his run again. Rob chucked a half-eaten orange peel at the garbage can and he was pissed off. Apparently, the aid station , which was also a "drop-bag" spot, had lost Rob's drop bag. I assume Rob had dropped some sort of nutritional aid, and now Rob was without it. Rob swore under his breath and then sped ahead yet again and opened up a good lead over the next few kilometres. It wasn't long before I decided to start walking up some of the uphills. I would guess it was around kilometre 36 that this decision had been made. I was still feeling reasonable (although the legs were a little heavy), but I really had intentions of finishing this race strong. I did not want the last 8k to be a walk-fest like it was the year before. With the hill walking, I had a little bit of concern that runners could be catching me. So occasionally, along the long straight stretches, I glanced behind me and thankfully saw nobody. This was reassuring. This was about the point in my race last year where I was passed by a couple of guys (like last year's winner, Jason Wellard) when I was doing the exact same thing. 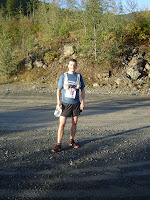 I walk-ran a decent pace uphill to the 40k aid station (Aid Station #8). 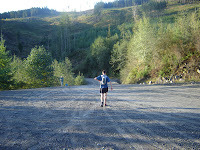 I was especially keen to get to this aid station, as my mom was actually in charge of it. It appeared as if she was surprised to see me. She immediately told me that Rob was 7 minutes in front of me. I chuckled and told her that I was going for 2nd place now, and that catching Rob simply wasn't gonna happen. I stopped briefly to get a couple of photos (for the blog of course! ), and to take in some electrolyte mix, and then I ran off. The uphill continued. This is definitely the toughest part of the course. It is essentially a 3k slow uphill that just drains all your energy. However, I battled through it and made my way to the top. My left hamstring at this point was flaring up slightly, and both calves were tightening up. However, the toughest part of the course was now behind me and I got to the marathon marker (the only distance marker I saw) at 3:30. All things considered, this was a great time. And best of all, I was not shattered. Not yet, at least. What goes up, must come down and the next few kilometres, thankfully, went downhill. The change of pitch was a welcome reprieve for my body, both physically and mentally. I didn't go fast, but I did run a decent pace down to the next aid station at 44k. I saw the sign at the aid station that said 12k to go, and I was relieved to see that the gravel road was no more, and it was now pavement from here to the finish. I ran for about a kilometre or so, until I had to stop and walk again. My legs were pretty wrecked, and pushing the running at this point would only cramp me up. My feet also hurt. The trail shoes were definitely too firm on the pavement. So for the duration, it was essentially a run for 2 minutes and walk for 20 seconds. Yes, it was a walk-run to the finish line, but it was certainly far less walking than last year. At times, I glanced over my shoulder to see if other runners were going to catch me, but again, there was nobody in my rear-view mirror. Eventually I came to a slow uphill that had a sign that said "3k to go". I had been checking my watch frequently over the past few kilometres, in an effort to estimate my finishing time. It did look like I could finish sub 5 hours, which would be a nice barrier to break. After the slow uphill, I rounded the bend and saw yet another aid station ahead. This for sure, must have been the last aid station. At the station, another sign said "2k to go". What! This was totally weird (but in a good way). I must have only run 200m tops from the last sign. Either this aid station really wasn't 2k to go, or someone who had no idea what they were doing was putting these distance markers up. After another few minutes, I saw the "1k to go" sign. Hilarious. This sign was probably more like 600m from the last one, but still nowhere near a kilometre. But, at this point in the race, I'll take it. No complaining from my end. I knew for sure now that a sub 5 finish was in the books. I went down around a bend and then began to walk uphill. As I walked, I thought....wait a minute...this is the final hill! I remembered this final hill from last year so clearly all of a sudden. I got a surge of adrenaline and ran uphill, over the crest, and then hammered to the finish. Spectators were now cheering and clapping. This "1k to go" was seriously like 150m to the finish! I crossed the line in 4:47:55. Good enough for 2nd place. It wasn't a great race, but it definitely was good. I am very pleased that it was a 24 minute improvement from my time in 2008. I know I could do this event in 4:30, but whatever, it really doesn't matter. I saw Rob Fontaine ahead and went over to shake his hand. Rob did win, but he experienced a difficult last 12k and finished only 7 minutes in front of me. Now, my racing season is basically over. 5 ultras done in 2009, and all of them went very well. I will likely do a couple more low-key events in the fall of 2009, but I will be taking a small break with the endurance training for a couple of months. 2009 has really been a great year for me. I now begin my thoughts on what epic adventures may lie ahead for me in 2010. Thanks Rob. It was good times. I'll definitely never look at potholes the same way ever again. And yes, I hope you can manage to join us next year for that "holy grail" trail run we talked about. It will be epic.